HF: Nam Jam Factory, a manufacturer of torches (not boiled fruit and sugar) was set up in Hong Kong in 1928 and subsequently opened a branch factory in Canton. 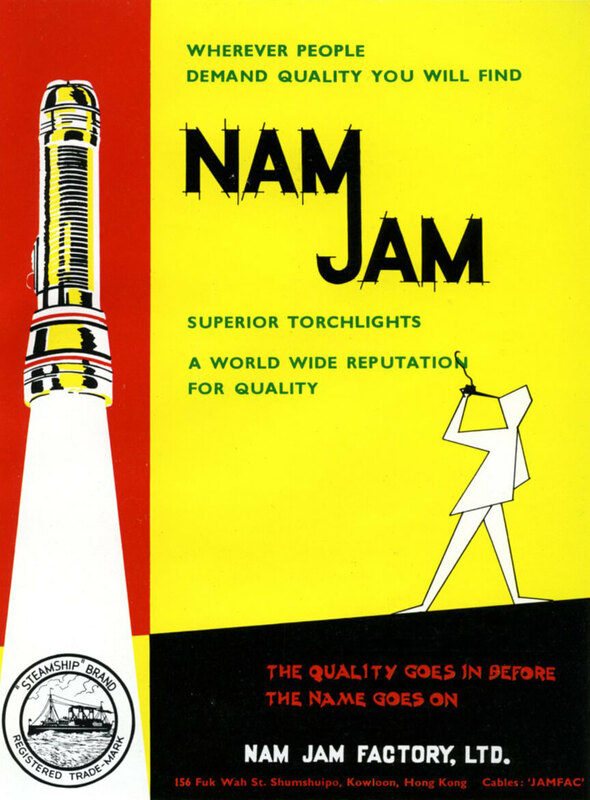 “Nam Jam Factory (flashlights) workers 1,000 and premises of 50,000 square feet.” Both seem very rough estimates. I don’t know which year was used for the Nam Jam figures. 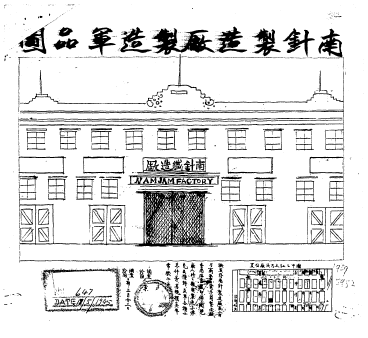 Elizabeth Ride provided this British Army Aid Group agent’s drawing made during the Japanese occupation of Hong Kong, WW2. 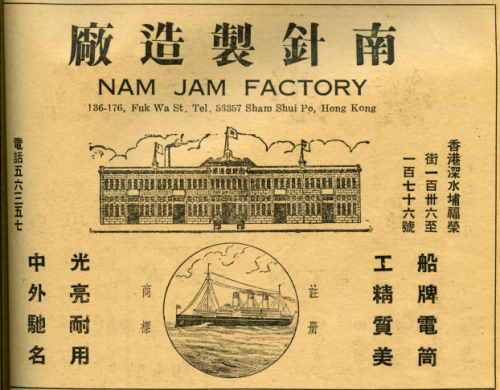 And here is an advertisement for the company from 1941 which gives the company’s address as 136-176 Fuk Wa Street, Sham Shui Po, HK. 1962 An advert in the Kenya Gazette 27 27th November provides the same Sham Shui Po address, demonstrates the company was exporting to Africa and that its products were flashlights, flashlight bulbs and “parts and accessories thereof”. 1963 This advert was supplied by IDJ. 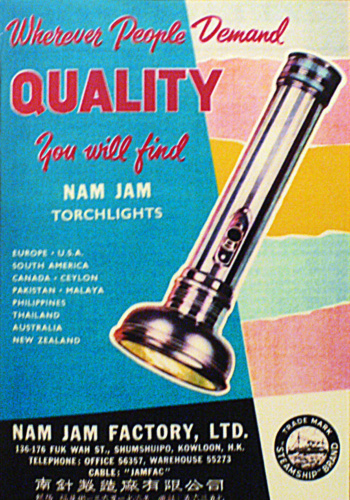 An undated advert also sent by IDJ. Hong Kong Memory (HKM) is a multi-media web site that gives free and open access to digitized materials on Hong Kong’s history, culture and heritage. The materials include text documents, photographs, posters, sound recordings, motion pictures and videos. This article was first posted on 4th July 2015. Packard Motor Museum, the Packard collection of the late Graeme Craw, holds a small flashlight with Made in Hong Kong, a focussing arrangement, and the same three funnelled steamship on the battery cap, Trade Mark Registered.. Photos if you’d like some..